As one of the largest monthly expenses, having a mortgage with an expensive interest rate can cost you thousands of pounds. When you are considering purchasing a new home, remortgaging or looking to let we would always suggest using a Lucra IFA to ensure you find the offer that is most suited to you and appropriate to your circumstances. Our personal service means we can come to your home or place of work, we can sit down and discuss what mortgages are available that suit you personally, we can also help you with your forms and applications. We tailor make an application on your behalf and then we can progress that application, communicating with solicitors, valuers, lenders and your estate agents. With banks and building societies becoming ever more cautious and tightening their lending criteria across the board, using a financial adviser has never been more important. It is absolutely crucial you receive the very best advice when making such an important decision. MORTGAGE IS A LOAN SECURED AGAINST YOUR HOME OR PROPERTY. YOUR HOME OR PROPERTY MAY BE REPOSSESSED IF YOU DO NOT KEEP UP REPAYMENTS ON YOUR MORTGAGE OR ANY OTHER DEBT SECURED ON IT. For mortgages we can work on commission or fees. The precise amount will depend on your circumstances. The Financial Conduct Authority (FCA) does not regulate commercial mortgages, most forms of buy to let mortgage and legal services. 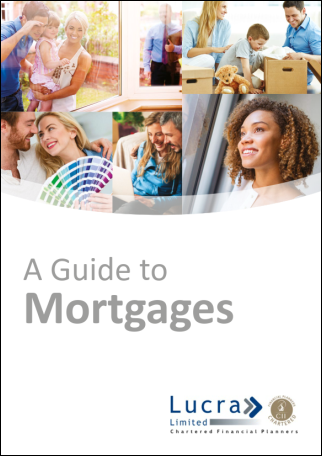 Please note Commercial mortgages and most forms of buy-to-let mortgages are not regulated by the Financial Conduct Authority. For those seeking to increase their existing borrowing, alternative finance options may be available and more appropriate for your needs. For example, a further advance from your existing lender or an unsecured loan (e.g. a personal loan). For those seeking a ‘Retirement Interest Only Mortgage’, a ‘Lifetime Mortgage’ may be available and more appropriate for your needs. Lucra Ltd provide our existing and potential clients with a range of written material to assist them in understanding the products we offer.